I mentioned in yesterday’s post that I have been working on a very old oak cabinet. 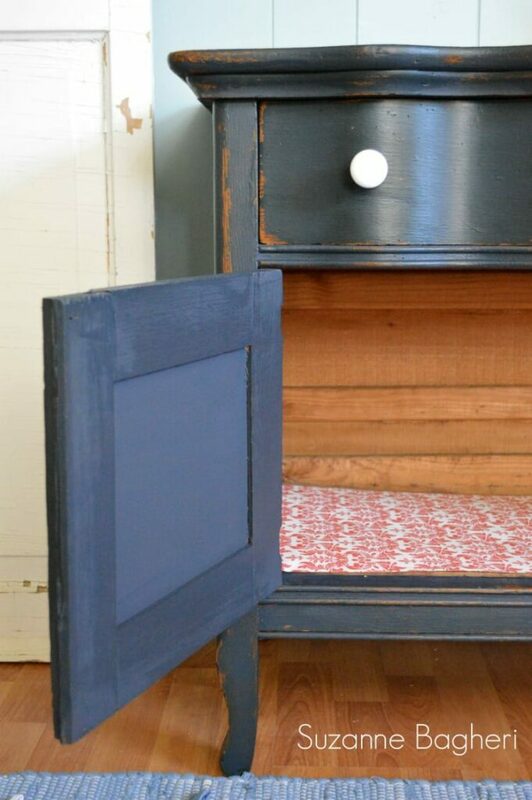 I decided to use a relatively new product, General Finishes Chalk Style Paint and chose the color Midnight Blue. 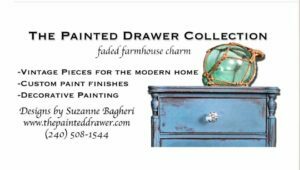 I’ve used this paint twice before, once on the Classic Black Dresser and once on the Rembrandt Red Buffet. I’m a big fan of this paint. 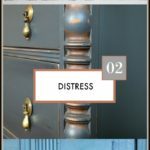 It is a chalk style paint that dries quickly, is easily distressed and fun to layer. On this piece, I decided Midnight Blue would be a good choice. 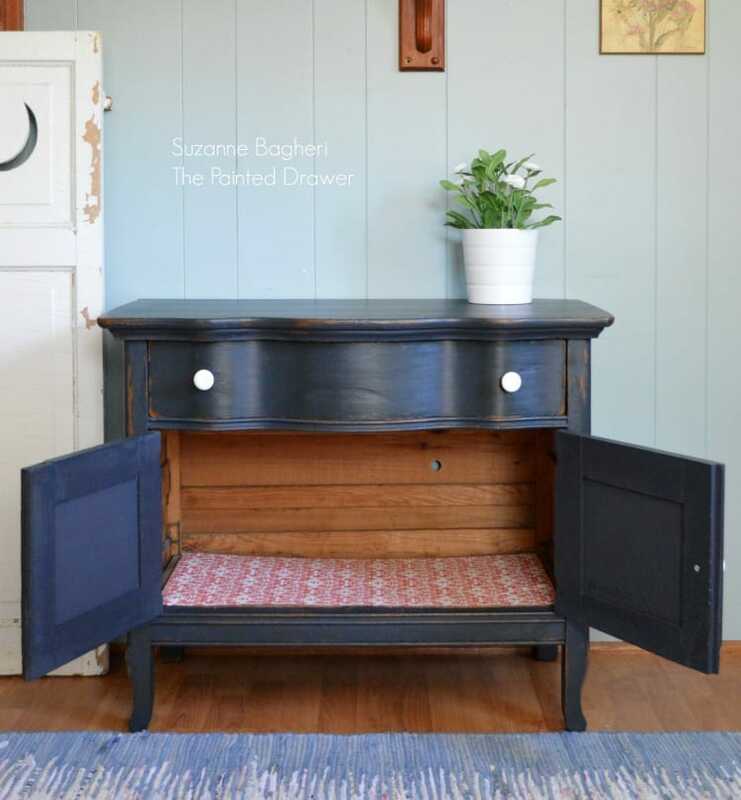 It’s a dark, rich navy and I knew it would pair well with the dark wood underneath. The inside of the piece shows its age (in the best way!). 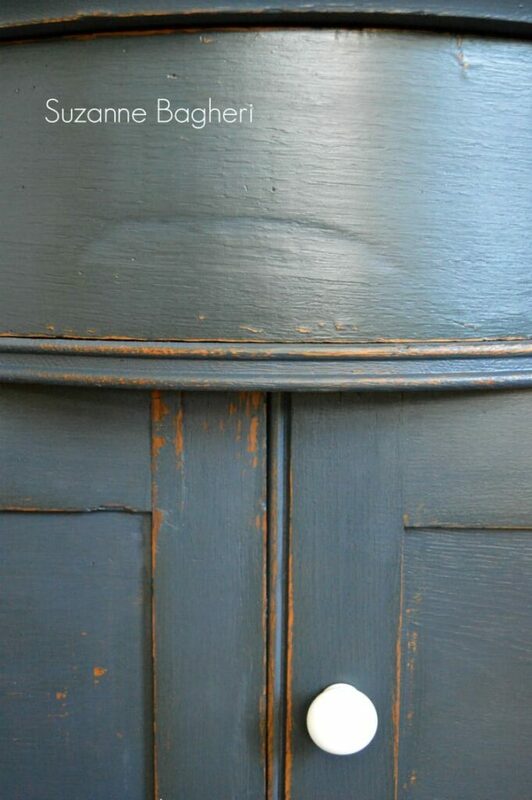 I also am happy with how the distressed wood peeks through the navy. I truly love that combo. I will share my Video Tutorial on the process tomorrow. It goes over applying the paint, distressing and applying the topcoat. Hint…it is not a wax! Looks good, I like the depth of the color. 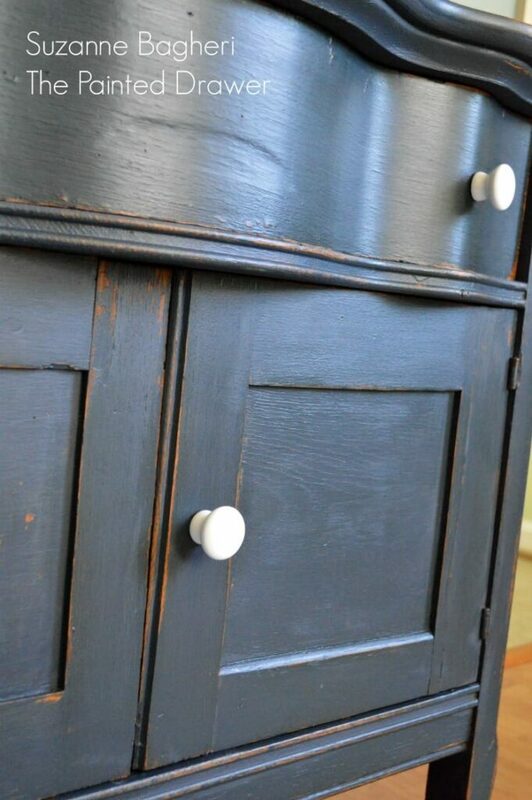 I am using General Finishes Milk Paint and I have one coat on and it is not smooth even after sanding. I have never used milk paint before or any GF products. Any ideas? 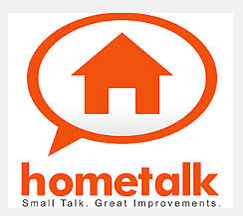 Hi Cyn, if you are looking for a silky smooth finish, then the GF milk paint likely won’t do. I mean, it is smooth but not like a chalk paint after you sand it. It is an acrylic based paint and not the best for sanding back. I prefer chalk paint for that. 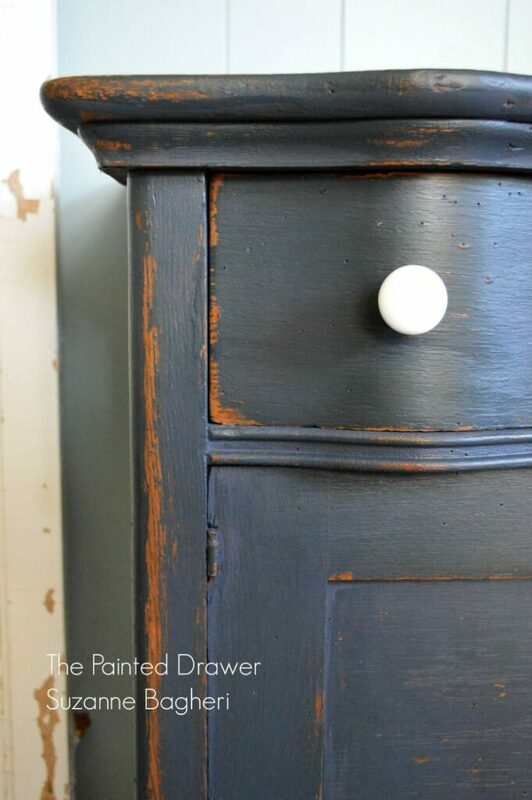 I use the GF milk paint on pieces that I don’t want to sand back too much, although I have layered it in the past. Just keep playing around with it. Best of luck! Beautiful! I always love all your work. Thanks for sharing it. Turned out nice Suzanne 🙂 Looking forward to the tutorial. Have a great day! Thanks, Annie! Finally got it published! i was afraid that you were going to tell me that. 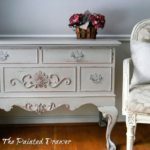 I have heard that I can use GF chalk paint with/over the milk paint. Do you know if this is true? 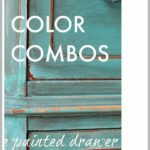 Could I use any other kind of chalk paint? 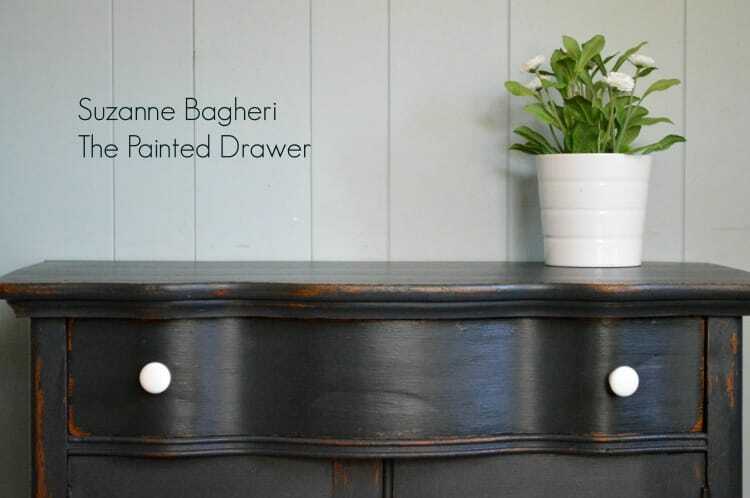 Yes, you can use the chalk paint over the milk paint – any kind of chalk paint. Or, you can mix the two. 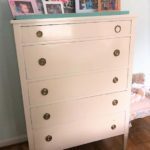 I like to mix AS Old White with the GF Antique White (milk paint) because it creates a paint that is strong but can be distressed. Just keep layering and take it in a different direction than maybe you were initially thinking (unless this is for a client and has to be a certain way). I would suggest sanding with 100 grit, wiping back and starting over if it has to be a certain way. I hope this helps?! It turned out just lovely. I like the deep richness of the navy, how it is almost black. I am thinking navy is the new black. So funny – I agree that navy is the new black. It seems to be a hugely popular color right now and I can see why. Thanks, Debra! 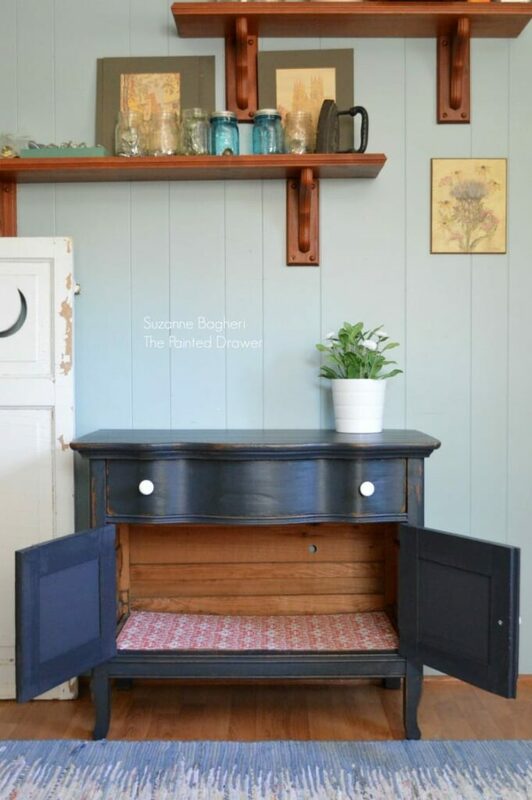 Suzanne, I am finally back working on my old bureau that I had painted with GF milk paint, I ended up sanding it back and using some DIY chalk paint. 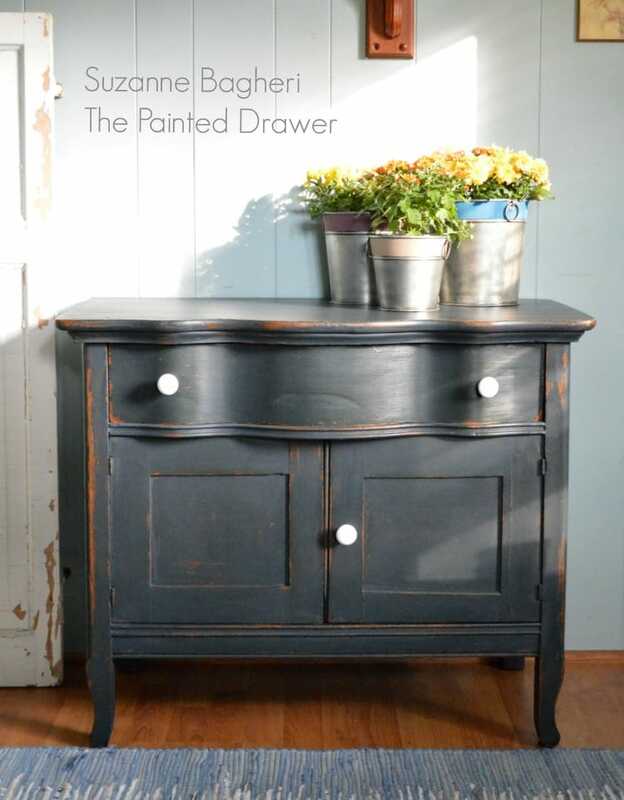 I think some of us are just meant to paint with chalk paint. I know when I put the new paint on the dresser went ahhhh or was that me? 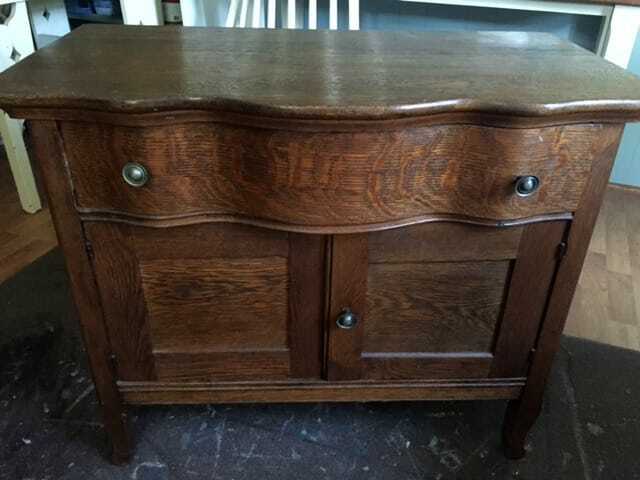 I have GF high performance top coat to use, the dresser is both stained and painted, but I am nervous about using it. I also had problems with GF gel not adhering well until I saw that another painted said not to wipe it back if you weren’t getting good coverage and that turned out so much better. Should I try the top coat or use wax like I usually do? Hi Cyn, you should wax it if you want that soft, rubbed wax look. I still prefer wax over chalk paint. You can use the GF topcoat and it should be fine. However, I feel you are more comfortable with the wax and at this point on this piece, you should go with what you know. I would hate for you to not like it after all of this effort! 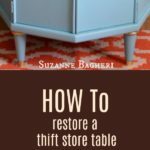 Try the GF topcoat on another piece that isn’t so big (like a little table) first and see how you like it. Cheers! 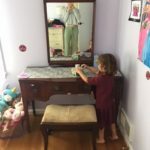 I am finally done with the old bureau and mirror. This has to be the hardest piece I have ever done. 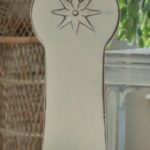 I had none of the problems on the mirror frame that I had with the chest, milk paint went on smooth, almost like I was painting on different wood, I was not. The GF stain, java covered up the many repairs extremely well. I will use both the milk paint and gel stain again. 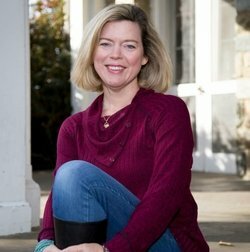 Thank you for all of your help with this project. How often do you tell your clients to rewax? Hi Cyn, I’m so glad that it all came out in the end! A true labor of love! I don’t tell my customers to rewax as wax doesn’t need it. The wax should cure hard and be good to go. Cheers! I have always been under the impression that once waxed and it hardens that you are done. Thank you for confirming that for me. Hi Cyn, yes, you should be done with the wax. Although, on dresser tops and on tables I also apply a coat of GF high performance on top of the wax for extra protection. Cheers!